E-Shop is the PUP that uses misleading techniques to prevent removal. Use Reimage to locate malicious components and get rid of them faster than with uninstall instructions. A full system scan blocks virus reappearance and prevents traffic to malicious domains. 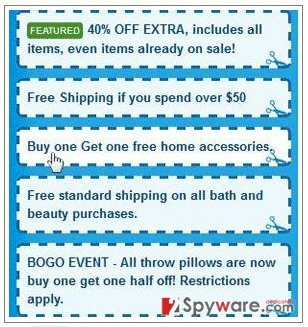 How can E-Shop hijack my computer? How to remove E-Shop virus? E-Shop is recognized as an adware-type program that has been added to this category because it is capable of displaying annoying advertisements during people’s browsing sessions. Typically, these notifications are labeled as ‘Ads by E-Shop’, ‘Powered by E-Shop’, ‘Brought to you by E-Shop’, ‘E-Shop Deals’, ‘E-Shop ads’, etc. These ads may follow you everywhere you go, so you may start regretting installing this adware on your computer. It is compatible with all web browsers, including Internet Explorer, Google Chrome, Mozilla Firefox and others, so you find find serious issues when trying to avoid E-Shop ads. Please, do NOT click these notifications because they can easily redirect you to unknown and even questionable websites. Finally, you may be surprised after discovering that E-Shop adware is capable of tracking your browsing activity and collecting your search terms, mostly visited websites and data that you enter when visiting these sites. It has been widely believed that this data is useless because there is no much era where people’s search terms, mostly visited websites and data that they add when visiting them can be used. However, if you don’t like to receive spam, you should think twice before downloading E-Shop adware to your computer. If each of your web browsers have been hijacked by E-Shop virus and you know that you have nothing to do with the installation of this program, you should think about its removal because it means that it has infiltrated your machine behind your back. beware that there are lots of security experts that have already added E-Shop to potentially unwanted program category, so you should be capable of removing it with the help of their programs. One of them is Reimage. Please update it to its full data base and run a full system scan to find all components that belong to E-Shop virus. Usually, E-Shop virus is distributed with the help of questionable download websites and dubious freewares. In other words, in order to avoid E-Shop redirects, you need to make sure that programs that you are going to install are safe enough. Don’t worry, we can give you a couple of helpful tips on how to install unfamiliar freewares, stop various adwares and how to remove them if needed. Firstly, avoid downloading unfamiliar freewares from questionable download sources. Secondly, if you are going to install a doubtful program, always read its end-user license agreement (EULA) part. Thirdly, E-Shop virus may travel as an attachment with various programs. Therefore, you should select ‘advanced’ or ‘custom’ installation option and follow the whole installation. Don’t skip a single step because you may overlook and add a potentially unwanted program to your system. These annoying ads can barely pose you any threat. However, in order to make them stop, you need to remove the related program. Follow these steps and remove E-Shop virus. By the way, it is also recommended to scan your computer with a reliable anti-spyware program afterwards. Here, look for E-Shop or any other recently installed suspicious programs. Wait until you see Applications folder and look for E-Shop or any other suspicious programs on it. Now right click on every of such entries and select Move to Trash. When in the new window, check Delete personal settings and select Reset again to complete E-Shop removal. Once these steps are finished, E-Shop should be removed from your Microsoft Edge browser. Here, select E-Shop and other questionable plugins. Click Remove to delete these entries. Now you will see Reset Firefox to its default state message with Reset Firefox button. Click this button for several times and complete E-Shop removal. Here, select E-Shop and other malicious plugins and select trash icon to delete these entries. Click Reset to confirm this action and complete E-Shop removal. Here, select Extensions and look for E-Shop or other suspicious entries. Click on the Uninstall button to get rid each of them. Now you will see a detailed dialog window filled with reset options. All of those options are usually checked, but you can specify which of them you want to reset. Click the Reset button to complete E-Shop removal process. This entry was posted on 2015-09-23 at 04:30 and is filed under Adware, Viruses. You can quickly scan the QR code with your mobile device and have E-Shop ads manual removal instructions right in your pocket. How did you remove E-Shop ads?